Have a unique gift or addition to your home decor in mind? I have done the simple to the complex, and love incorporating unique elements, such as Nixie tubes, single plane displays, or stained glass. I have a wide range of hardwoods available in my workshop, and can get just about anything you want to work with. And I’m happy to make customizations or adjustments to products available in my standard product catalog as well - a longer shelf, an extra magnet, a different color cord. The sky is the limit since I build everything myself. I’m not happy unless you’re happy! This simple-but-elegant felt-bottomed walnut stand was built to complement the client’s dreidel collection. This unique artistic lamp was inspired by a client who had picked up the wooden surfboard. The arms & legs, head, and overall position can be adjusted, and the lamps are controlled by two independent circuits for the head & the limbs. Shadowbox for a naval officers retirement ceremony, with the flag holder front-and-center, and velvet-backed areas for pins, medals, and other mementos. Two dozen oak oval mirror frames, prior to painting, for the Spring Irvine Spectrum Center Carousel refurbishment. Transformation of a blown out guitar foot pedal into a lamp for a musician, reusing the existing controls. I’ve built many custom lightboxes, to show off client glass from antique video games as well as to highlight heirloom stained glass. Styles include recessed wall mounted, tabletop, and wall hanging. Walnut piece custom configured to precisely fit a compact kitchen on a houseboat, with lips on all the shelves to blend with the existing teak work and keep everything in its place while the boat is in motion. This lamp was inspired by the work of StickBulb, doubling up their 6' Floor Torch into a lamp that almost looks like it's taking off! The arms are adjustable via a small chain that gives a range of slack. The lighting itself is provided by color-changing LED strips that are controlled by a remote control. On commission for $800; shorter lengths or different configurations possible to fit your home. This is the corner of a 14x14” frame I’ve been milling for a framing shop - both out of MDF, shown here, and solid hardwood. Depending on the complexity and demands of the project, I provide either dimensioned sketch, or a detailed rendering, for us to work from. 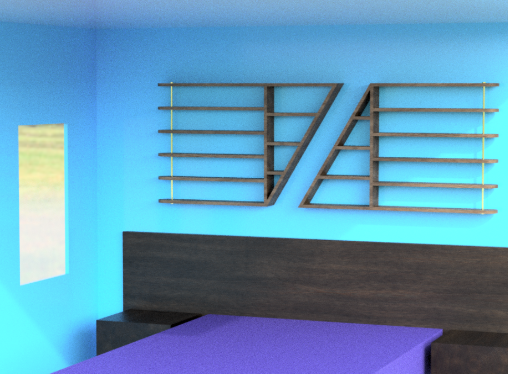 And I often do renderings of some of the unique smaller pieces I plan to make into products before I start building as well. Check out a few of the images below, some of which have made it into products or projects, and others which have been cut by myself or clients after the design phase. Feel free to reach out on this process - its free if you purchase the piece, and available at a modest cost if you just want some help in exploring rough ideas. I’m not immune to using this to explore some of my own ideas prior to building them! This “light tower” idea became a product that I sell only at my in-person festivals, with unique combinations of stained glass. The client was interested in a unique and artistic box to hide all his video electronics, that allowed for air flow, and that had a removable shelf for some of the hardware. Though I never ended up building it, it posed a unique design challenge! The client completed an impressive hike around all of New York State’s Finger Lakes, and wanted a commemorative plaque to remember this by. Note that personal details have been removed from this rendering. This rendering of a design proposal formed the foundation for the jewelry box that I ultimately built for the client. I originally proposed two different designs for the client on potential jewelry boxes; this design was ultimately rejected. Artistic piece featuring randomly oriented walnut & maple blocks.